From 2013 through 2017, Coca-Cola UNITED’s growth was nothing less than transformational. Over the course of four years, beginning with the acquisition of Oxford, Alabama, in March of 2014, and ending in October 2017, Coca-Cola UNITED successfully acquired more than 40 additional facilities and market territories in the southeastern part of the United States. As part of that process, we transitioned more than 7,000 new associates and about 100,000 customers into the UNITED family. To sustain our local business operating model – which is founded on local relationships, dedicated customer service, and strong community engagement — UNITED increased its workforce by approximately 10 to 15 percent in the markets it acquired. In addition, more than $300 million in capital investments have been made to build new, or improve existing, facilities for our associates, as well as add to our fleet and upgrade equipment in an effort to better serve customers. 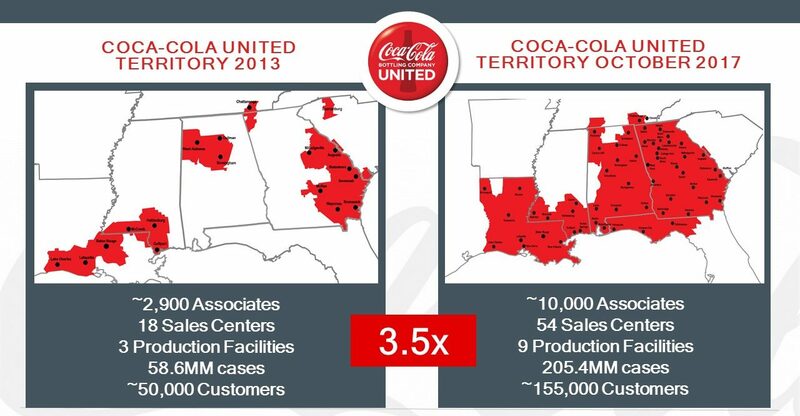 Today, Coca-Cola UNITED has approximately 10,000 associates, located in 54 sales and distribution centers and nine production facilities throughout six southeastern states. Our business has more than tripled since 2014, when we had some 2,900 associates located in 18 sales centers and three production facilities. At that time, we had some 50,000 customers. Today, we are proud to partner with more than 150,000 retail and on premise customers in the states of Alabama, Florida, Georgia, Louisiana, Mississippi, South Carolina and Tennessee.